I went to Tucson in November, to gather with my sisters at my mom’s house for Thanksgiving. While there, I worked on the project, finally getting a peek inside a part of the National Park System that I had been been attempting to see all year: the Western Archeological and Conservation Center, a place containing millions of pieces of American history, shipped there from parks all over the West to be preserved and restored. I got a one-way ticket to Tucson. And when everyone else got back on planes, I got in my mom’s van, a 2001 Pleasure-Way Traverse. Chris Burns, a friend in Jacksonville, agreed to fly to Tucson and make the drive back with me. A few months earlier I had been dreading such a long drive. But as I began to plan this, I started to look forward to the idea of having one simple goal each day: cover a bunch of miles and maybe see a few things along the way. With Chris along for the drive, it turned out to be a relaxing and memorable piece to this year — everything from one night spent camping in a Walmart parking lot in El Paso to another night at Big Bend National Park. Here’s the column I wrote about the trip (and a few photos from the road trip). When I was given a fellowship last fall, allowing me to spend a year traveling to national parks, my mom immediately made an offer. I could use her van for the year. She bought the Pleasure-Way Traverse in 2001. It’s basically a Ford E-250 converted into a campervan. She put 100,000 miles on it, some on drives from Arizona to Jacksonville with her dog, Max, and partner, Abe. Mom never was a vehicle person, but she sure loved this one. So I thanked her for her offer, but said my plan was to travel by plane. I think I said that I didn’t want to waste time driving. This year has reminded me about quite a few things. Plans change. Life is short. And there’s something to be said for a long drive. When Mom got cancer and realized she was dying, she said she wanted her kids to have her vehicles, a red Jeep and the silver van. One of my sisters said she wanted the Jeep. My other sister already had a camper. So did I want the van? No, I said. I didn’t know where I’d keep it. And, although I didn’t say this, I dreaded the idea of driving it cross-country. But in June, while in Yellowstone, I changed my mind. I called my mom’s house. Mom wasn’t able to talk on the phone by then. But my sister relayed the message. And she said Mom got a big smile. So that’s how I ended up with a one-way plane ticket to Tucson. We gathered for Thanksgiving, scattering Mom’s ashes in Saguaro National Park and atop a nearby mountain where, 16 years earlier, we had scattered Dad’s ashes. Then a couple of days later, when everyone else got back on planes, I got on the road. Chris Burns, a friend in Jacksonville, offered to fly to Tucson and help with the task of driving back to Florida. As grateful as I was for his offer, I kept trying to give him an out. And he kept insisting he wanted to do it, that it would be enjoyable, maybe even fun. When I was growing up, we made all kinds of long drives. It doesn’t seem like Americans do that as much anymore. I know I don’t. And that’s too bad. It’s not just that you see things on a drive that you’d never see on a flight. It’s how the road unfolds slowly, how it forces you to adjust to its pace, how the unplanned is a part of the plan. The first day, after a hike in Saguaro National Park and dinner at a good Mexican restaurant, we didn’t get to El Paso until nearly midnight. Instead of staying at a hotel for a few hours, we decided to camp in the parking lot of a Walmart. The store was still open and had a day-after-Black-Friday ambience to it, which made the next night – a campsite in Chisos Basin in Big Bend National Park – seem even more serene. We watched the sun set and moon rise over the Chisos Basin. We saw sagebrush tumbling across a two-lane road in Texas one day, and two giant spiders crawling across it the next. We smelled rain in in the desert, a scent that instantly took me back to Mom’s backyard. We spent a night with Chris’ in-laws in Houston, savoring warm showers and homemade zucchini bread. We had some minor car problems in Mississippi – a loose, rattling running board — and ended up deciding to stop there and spend the night at Gulf Islands National Seashore. We met memorable people, from fellow travelers to locals to the teenage girl behind the counter at a Texaco/McDonald’s. Chris asked about the fresh tattoo on her wrist. She explained it was her daughter’s name, Marley. And that her daughter’s father had picked the name, saying he had a cousin named Marley who had died. And that she had since learned this wasn’t true, that the pothead (her description) had picked the name because of Bob Marley. And that when she went to the tattoo parlor the night before, she hadn’t even planned to get a tattoo. “I wanted to get my tongue pierced, but it was too short,” she said. You don’t get these kinds of memories when you fly across the country. We drove the entire 2,200 miles (with a detour to Big Bend) without listening to the radio. I had my iPod loaded with music and NPR podcasts. But the only time we even turned on the radio was to put in a cassette tape I found at my mom’s house. It said it was recorded in 1979, when my dad spent a summer preaching in a church in England. I was hoping to find Dad’s voice. Instead, I heard English accents, garbled by the tape’s degradation. So I ejected the tape and we drove on, talking about anything and everything, occasionally saying nothing and just listening to the whoosh and hum of the road. I can’t drive across town without impulsively turning on the radio. But somehow we went across country with it off? I remembered how the last time I drove cross-country, with my mom after my dad died, we didn’t turn on the radio, either. I can’t explain this. I just know that when we neared Jacksonville, I had mixed emotions. I was happy to know I was almost home, but also surprisingly sad the drive was over. 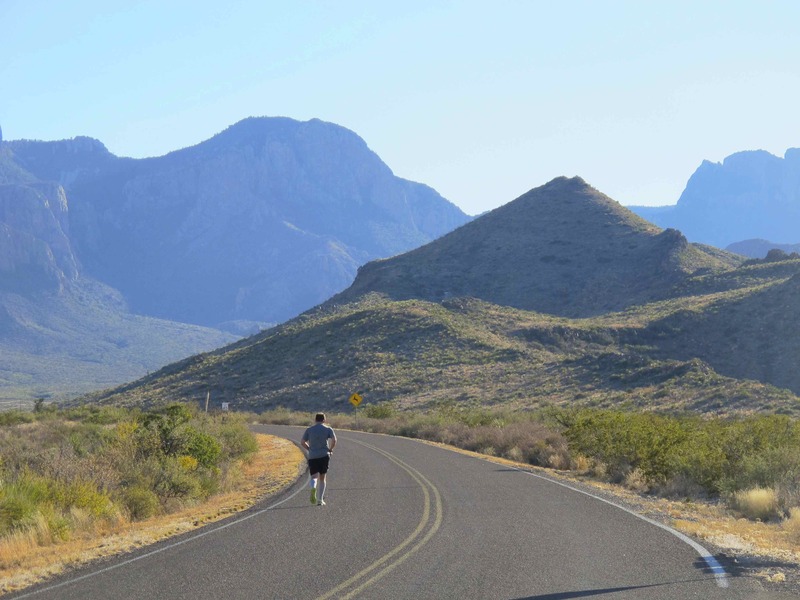 Among the things I didn’t mention: When we got to Big Bend, Chris wanted to go for a run. The ranger at the visitor’s center discouraged this, saying that they had just had a mountain lion attack in the park a few days earlier, and adding that seeing something running triggers the prey instinct of the mountain lion. The ranger said they especially discourage running alone at dawn or dusk. It was late afternoon. Not that this dissuaded Chris. He did decide to avoid running on the trails, but instead ran the final 6 miles of the drive to our campsite — climbing 3,000 feet and then descending into the Chisos Basin. I have to admit that, after being unable to run all year, I was envious. Especially when he made it to the campsite without seeing any mountain lions.